SLS Sword Pinstriping Brushes series 81 is for Pinstripers and Sign Painter. This Pinstriping Brush has a mixture of Black Synthetic and Blue Squirrel hair. We have had recent success with this blend of hair and decided to put it in a Pinstriping Brush. This chrome ferruled brush has a length out of 1-7/8" and is available in sizes 00, 0, and 1. 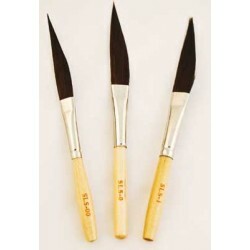 This brush will perform well in all mediums of paint with the emphasis being used with urethanes. The SLS Sword Pinstriping Brushes series 81 listed below.